We’re back with another Game Crazy Giveaway! Last week’s Bioshock 2 Action Figure 2-Pack Giveaway was a huge success and we would like to thank all the entrants for their enthusiastic participation! 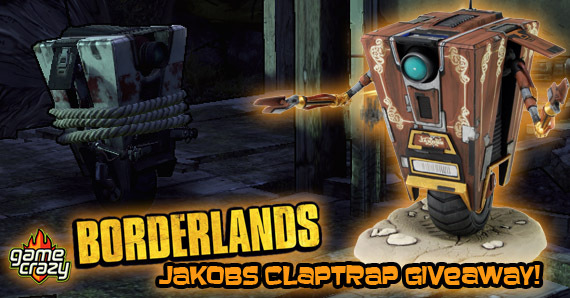 This week we’re giving away a very special deluxe action figure of Jakobs ClapTrap, a character near and dear to the hearts of all Borderlands fans. Continue reading to learn how you can enter to win! 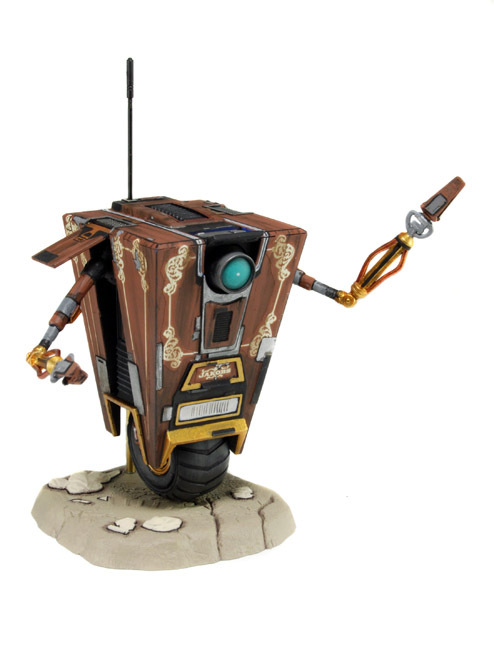 The Jakobs Representative Claptrap is a special version of Claptrap from the Jakobs corporation. This version of Claptrap appears in The Zombie Island of Dr. Ned DLC. Jakob’s Claptrap has wood paneling with brass decorations, following the traditional, old-fashioned Jakobs aesthetic. The figure include display base and is fully poseable, featuring all new unique decoration to simulate the woodgrain finish. Intricate decoration and tampo printing process re-creates this special version of Claptrap seen in both Borderlands 1 & 2. Bioshock 2 Rare Action Figure 2-Pack Giveaway! Resident Evil 4 Action Figure Giveaway – Ada Wong and Verdugo! Bioshock 2 Giveaway – Deluxe Big Daddy Bouncer Action Figure God of War 2 Action Figure Giveaway! Dead Space 2 / Borderlands Action Figure Giveaway – Necromorph Slasher and Psycho Bandit! Resident Evil 4 Action Figure Giveaway – 7″ Leon & Chainsaw Ganado Resident Evil Action Figure Giveaway – Sheva Alomar & Crimson Head Zombie Rare Soul Reaver Action Figure Giveaway – Material Plane Raziel!